As a struggling high school student, I credit Martin Gardner for instilling in me a life-long passion for learning mathematics and science that eventually led to my earning a B.Sc. in Mathematics and Physics, even though I have no special ability in either subject. I have been a math and science educator since 1964 and one of my goals has been to share my love of both subjects with students and teachers. The current educational system, with its heavy emphasis on testing, makes doing so more difficult than it was in the past but not impossible. I learned what I know about these subjects the hard way so I have a lot of sympathy for students that try, but struggle, with either or both subjects. 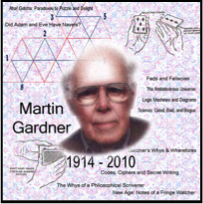 No, Martin Gardner was not one of my teachers. I never met him or even saw him at a distance. He didn’t actually know me, but he visited me every month from 1956 to 1981. During those years he wrote the Mathematical Games column for Scientific American magazine. I never missed a column and copied and collected them for years until they were republished in book form. You can imagine how excited I was to find a web site devoted to the problems and puzzles of Martin Gardner. There are 63 puzzles and problems in the Gardner section of the web site. Each puzzle or problem is presented in the form of a full-color graphic with text. You can play in your web browser or download every puzzles as a Print ‘n’ Play pdf file. A solution or explanation is also available for every puzzle or problem. Before I provide the link to the Gardner site, here is a simple math experience (for kids and adults) that combines geometry and number, and makes a nice segue to one of the problems on the Gardner site. A simple closed curve is a curve drawn on a flat surface that starts and stops at the same point and doesn’t cross itself (see the diagram below). A simple closed curve divides the plane into an inside and an outside. And, staying within the dimension of the paper, you can’t get from the inside to the outside (or the outside to the inside) without crossing the curve. The orange curve in the diagram below is an example of a simple closed curve. I’ve labeled the inside and the outside of the plane (flat surface) the curve is drawn on. 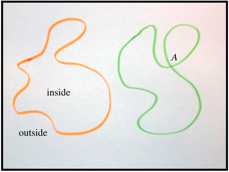 The curve drawn in green is not a simple closed curve because it intersects itself at point A.
I’m sure you understand that you could color the inside of the orange simple closed curve one color and the outside another color and the two colors would not mix because they are separated by the orange boundary. For a long time the obvious fact that a simple closed curve drawn in the plane creates an inside and an outside was considered so obvious that mathematicians never bothered to state the theorem, let alone prove it. The result was first stated as a theorem in Camille Jordan's textbook, "Cours d'Analyze de l'École Polytechnique" in 1887, and hence bears his name. Jordan found that proving this theorem is by no means easy, and in fact the proof he gave in his textbook is completely wrong. I will simply state his theorem and leave the proof to the professional mathematicians. Jordan Curve Theorem: Any continuous simple closed curve in the plane, separates the plane into two disjoint regions, the inside and the outside. Now, let's play with the theorem. I've done the following activity with second graders and above so don't let the word theorem scare you off. Take a sheet of paper and draw a simple closed curve. Make it as squiggly as you can but don’t let the curve cross (intersect) itself ant any point. 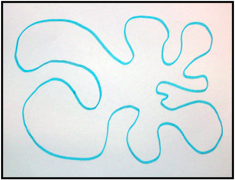 Here’s an example of a simple closed curve drawn in blue. Carefully draw a second simple closed curve, in a different color, over the first simple closed curve. 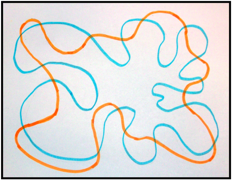 The following picture shows how I've overlaid an orange curve over the blue curve. When I taught this to second graders, I was actually wanting to do an odd/even number activity and I knew kids liked to draw and color so I combined a bit of geometry with number. For reasons unknown to myself or the classroom teacher, odd and even numbers were listed in the second grade curriculum. The math workbook defined odd and even numbers but students had only to identify whether a number was odd or even. Students were never asked the sum of two odd numbers (an even number), the sum of an odd and even (odd), or the sum of two even numbers (even). The kids were justly mystified as to why anyone would care to know about odd and even numbers. Now, circle every point the orange curve intersects the blue curve. Count the number of intersections. In the above example, there are 18 intersections. And 18 is an even number. How many intersections did your example have? Is there a pattern? If you pick a point outside a simple closed curve and then draw a line to any point inside the simple closed curve and then again to any point outside the simple closed curve, how many times did you cross the simple closed curve? The answers to all of the above questions will help you quickly solve the In ‘n’ Out puzzle on the Gardner web site. Here's the link. Here's the link to all 63 of the Martin Gardner puzzles. Pick the puzzles and problems that interest you and ignore the rest.